My name is Judy Verseghy, and I am the Chair of the Mimico Children’s Choir Board of Directors. As you know, the Mimico Children’s Choir is looking for more members from our parent body to sit on our board of directors. As a Board member, you would meet once a month with our group and help shape the direction of the Choir. These positions are so important, as they not only ensure that our future is well thought out by folks who are invested in maintaining and improving the Choir, but also because without a board, there can be no Choir. You may have at one point considered being on the board, but have had questions or concerns about time commitment, required skills, or the responsibilities involved. If you would like to speak with someone regarding these issues – or about any thoughts that you might have about the Choir – I will be at our rehearsal this coming Thursday to meet with parents and answer any questions. Please consider how you can make a difference in our community by joining the Mimico Children’s Choir board. Tomorrow is our first rehearsal of our 10th anniversary season! Welcome to all of the new families that are joining us this season, and to the returning choristers – welcome back. Thank you to the families that have registered online and payed through e-Transfer. For those that still need to, click here to REGISTER NOW. Payment through e-Transfer is ideal, however paying by cheque or cash in person works as well. Fees are -$250 per chorister for the season, $200 for each additional sibling. Please also add $25 to your fees for early arrival supervision if your chorister will be arriving at the church between 3:15-3:50. If arriving between 3:15-3:50 please note that snack will not be served, however choristers are welcome to bring a peanut free snack of their own to have at this time. If you wish to have your chorister walk over to the church from John English with our parent volunteer at 3:15 dismissal and we haven’t reached out to you individually please send us an e-mail. **Save the Date for our Annual General Meeting** Parents are invited to attend our AGM that will be held at the Mimico Baptist Church on Saturday September 30 at 10am. Thanks everyone! And don’t forget to bring a friend to show them how much fun we are going to have this season! *Construction Note* – The Mimico Baptist Church is currently undergoing renovations but is very open and ready for rehearsal tomorrow! Please use the front entrance with caution. 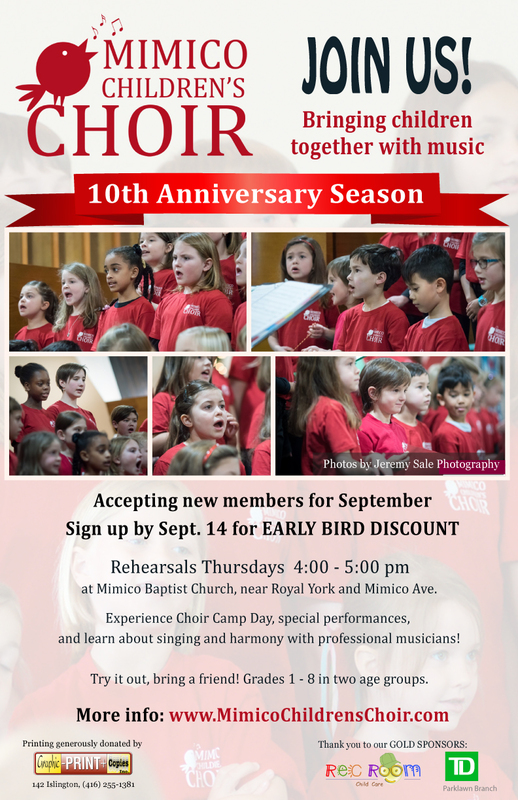 One last reminder for those planning on joining us for choir this season (our 10th anniversary season! ), the last day to take advantage of early bird registration rates is tomorrow (September 14th)! We hope you can join us! Rehearsals will take place at the same location (Mimico Baptist Church) but at a NEW TIME 4:00-5:00pm. Our first rehearsal is next Thursday, September 21st. As rehearsals begin at 4pm sharp, please plan to arrive 5-10 minutes early. e-Transfer is recommended. Please remember to email us the security/password that you have chosen to access payment. Although e-Transfer is preferred, we will also accept cheques (please make them out to the Mimico Children’s Choir) or cash, if that is preferable. Please pass along this message (and/or the image below) to any friends/family/neighbours you think may be interested in joining the choir. Hi there Choir families (past and present!) and happy January! We hope the new year is off to a great start for all. Speaking of great starts – it’s time to start the second half of Mimico Children’s Choir’s 10th anniversary season! Registration is up and running, online registration is super easy and the e-Transfer payment system is convenient and fast! NEW Rehearsal time: 4-5pm – still on Thursdays. – Please also add $25 per chorister for early arrival supervision if your chorister will be arriving before 4. Registration – please go the the website www.mimicochildrenschoir.com and click on the registration link to fill out an online registration form. Hard copies of the form will also be available at the first choir rehearsal. Payment – e-Transfer is recommended. Please remember to email us the security/password that you have chosen to access payment. Although e-Transfer is preferred, we will also accept cheques (please make them out to the Mimico Children’s Choir) or cash, if that is preferable. Last but not least – when do we start? First rehearsal is Thursday January 11th from 4-5pm at Mimico Baptist Church (80 Hillside Ave.) Bring a friend to show them how much fun we have, our 10th season is sure to be a great one!! We hope you can join us again this year. Of course if you have any questions please let us know. Me again, just writing to let you know that registration for our 10th Anniversary season of the Mimico Children’s Choir is now OPEN! We’re so excited to be joining you for what is sure to be a fun-filled season, where we’ll be singing a selection of our favourite tunes from years past, and some of the best hits from the Wizard of Oz! Early bird registration saves you $25 per chorister, and is on from now until September 14th. We take etransfers! So quick and easy. Just let us know the password you’ll be using. The first day of Choir is Thursday, September 21st. Choir now runs from 4 to 5 pm, still at Mimico Baptist Church. There is an early drop-off period from 3:15 onward, which you can access for an additional $25/chorister for the year. Unfortunately, we are unable to provide snack this year. Choristers are welcome to bring their own snacks if they access the early drop off time. …because who doesn’t love Oz? Wishing you all a wonderful rest of your summer! I hope that this message finds you well, and that you’ve been able to take some time to enjoy the brief bits of sun amidst all of the rain that we’ve had this summer. There’s been lots going on behind the scenes at the Choir during this break, and we have some important announcements for you. I regret to tell you that our beloved Mary Bella has stepped down from her role as Board Chair. Mary has been with the choir, both as a conductor, and then as Chair, for the better part of the past decade. With her leadership, we have seen the Choir go from a little ragtag group of kids to the polished and beautiful group that we have today. Mary has never shied away from a challenge, and has worked tirelessly to not only have this Choir survive, but thrive. I know I can speak for all of us when I say that her no longer being with us in an in-depth manner will undoubtedly leave a void that no one else could possibly fill with the same boundless determination, and that she will be sorely missed in her role at the helm of this ship. Thankfully for us, though, Mary is still staying on as director of Local Vocals, so we will surely be seeing (and hearing) her yet thought out the year! Thank you, Mary, for continuing to share your wonderful musical gifts with us! But that’s not all, folks. This year is bringing us another change: this one, undoubtedly positive! As you may know, I have stepped down as the Community Engagement Manager for the Choir. But fear not, lovely friends, for Tania Krishnan is here to save the day as your new Community Engagement Manager! Some of you may know Tania as the fundraising powerhouse on the John English SAC, in which case you already know what a wonderful addition she’ll be to the team. For those of you who haven’t met Tania, you’re in for a treat. She’s organised, hard-working, goal-oriented, and is also a truly wonderful person. I’m so excited for all of you to get to know her better, and am confident that her skills and talents will be a real asset as the Choir continues to grow and improve. As for me, I’m not really going anywhere. I’m moving from my CEM position, onto the board…so you may get some emails from me, yet. You can’t get away from me that easy! I can’t wait to see all of you on September 21st at Mimico Baptist Church for our first rehearsal of the new season! An invitation to join in some summer music-making! Briar Boake (local songstress) is performing Something to Sing About! – a concert presented by the Mimico by the Lake BIA in Mimico Square on Friday July 14th starting at 7pm. Briar and the BIA would like to invite members of the Local Vocals and Mimico Children’s Choir to join her for THIS IS MY HOME, and possibly perform SING! if we have enough voices. We would perform at approximately 7:45pm. Please submit a separate RSVP form for each performer in your family. (No need to RSVP if you won’t be performing). We will be in touch via email to give more details for those who would like to participate. Looking forward to it!